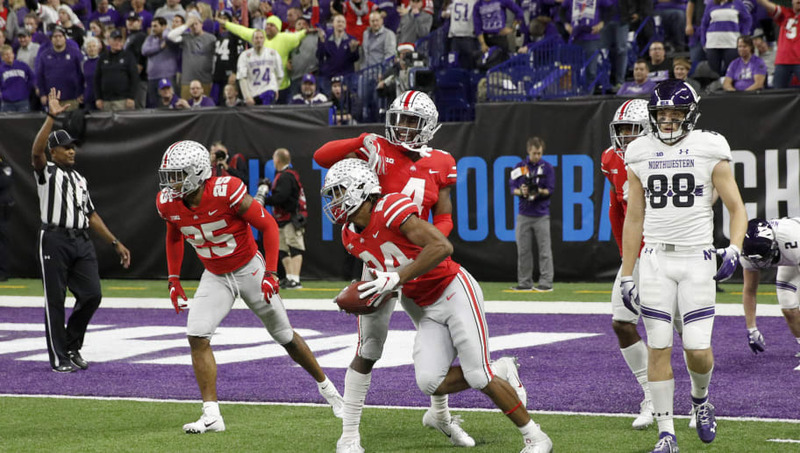 ​Dwayne Haskins threw for 499 yards ​and five touchdowns Saturday night at Lucas Oil Stadium in Indianapolis to lead the Ohio State Buckeyes pas Northwestern in the Big Ten Championship 45-24. It's OSU's second consecutive conference title, and 12-1 on the season, they'll now anxiously await whether or not the College Football Playoff committee was sufficiently convinced that they deserve a shot at the national title. ​​With one-loss Oklahoma prevailing in the Big 12 Championship by exacting revenge against arch-rival Texas earlier in the day, the Buckeyes face some serious competition. They'll need a little luck to overcome the Sooners in the eye of the committee -- to say nothing of undefeated Central Florida or even two-loss Georgia -- but as of right now, they're still alive. ​​The Scarlet and Gray weren't overwhelming out of the gate, and even allowed Pat Fitzgerald's Wildcats to get within a field goal when Cameron Green scored from two yards out with eight minutes to go in the third quarter. But the Buckeyes outscored their opponents 21-3 the rest of the way, proving in no uncertain terms that they possessed an extra level of class. Though they may be destined for the Rose Bowl (and there's no shame in that), nobody in Columbus can hang their heads. A 12-1 record and a conference title is nothing to sneeze at. ​And that Haskins kid is a pretty nifty dude.